The campaign is BACK and bigger and better than before – visit the site here! OK, so the Atheist Bus pledge at Pledge Bank has expired, and 877 people promised they would give Â£5 to put an atheist ad on a London Bus. We were 3801 short. But hang on. 877 people backed the idea! When I setup the pledge on 20th June I thought it was a smart and sweet idea, first penned by Ariane Sherine in this article at Comment is Free, and that it was worthwhile spending half an hour making the pledge and making the bus mock up shown above. But I had no idea things would go even this far, and I think Ariane probably thinks the same (we’ve subsequently met in person to discuss the idea). Essentially Ariane came up with the idea, I gave it the smallest of small pushes, and the ‘campaign’ was born. I use speech marks for a reason, for this has been like a small snowball rolling downhill and getting larger and larger, more or less uncontrolled. There’s no campaign finance, no campaign team. There are just a number of people who liked the idea and jumped on the bandwaggon bus, so to speak. So 877 pledges is a damned good outcome! The height of atheist bus fame was reached yesterday when Matthew Parris wrote about it in his column in The Times, and this was picked up in the Daily Telegraph today. Rather unfairly neither mentioned Ariane was the person who first thought of this… Londonist also has a rather snide go at our efforts here, rebutted by Wrong In Their Mind Tanks here. We were also previously covered on Richard Dawkins’s website. So what next then? Well, with little effort and no resources we have shown that a fun campaign can catch the imagination of a number of people. As far as I’m concerned this means we need to fortify our efforts this autumn, making a dedicated website campaign for the atheist bus idea – with possibilities to donate different sums to the effort, and also with some different possible outcomes – small ads inside buses would be cheaper if we don’t accomplish the whole thing. The problem is that we need this campaign effort to be under the wing of some organisation – ideally the National Secular Society (of which I have been a member for a couple of years). However Terry Sanderson (President of the National Secular Society) commented on Ariane’s article in a rather negative way, stating that the money might be better spent elsewhere. But how many of those 877 folks are actually donating to other secular causes at the moment? Plus surely any campaigning organisation needs a light hearted side as well as a serious side? Anyway, as far as I’m concerned, the work on this has only just started – and I’m super happy to have 877 people pledging, and we’ve managed to get a secular story in The Times and The Telegraph which must be considered a big success. The fight goes on! 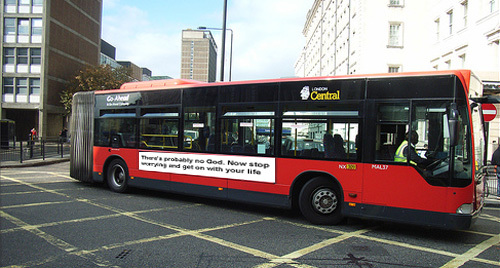 Atheist Bus Campaign – the sequel! I wish I could read the same kind of message (en français bien sûr) on Montréal buses. What exactly is the point of this? Hey, thanks for swinging by the blog. That said, if you’re not already on Atheist Nexus, I suggest you get on over there and start a group, get the word out. They are having their own little donation-problems at the moment, but they’re a great networking site and through a group there you might be able to snag some more supporters and donations. Tons o’ luck to you! Should also have said: I do know how to run political campaigns in general. It’s just life has been rather manic recently. More to follow on this though! Thanks for dropping by my blog, Jon, and I followed your recommendation and wound up here reading this follow up piece. Indeed, you are right: with no concerted organised ‘campaign’ to speak of (as was alluded to by the national press) you have achieved much. I completely support you in what you are doing – so big up the Worth!